Custom designed for your tablet, the GeckoCare Removable Privacy Screen for 15.6" Inch Widescreen Laptops , Landscape protects confidential information and sensitive data from prying eyes. Designed to attach to your tablet and shield your data from casual viewers when held horizontally, the screen offers an opaque view of your screen to anyone not directly in front of your 15.6" Inch Widescreen Laptops or closer than 30° to either side. So you can view, read, or type with confidence, even in a crowded room. FULLY REMOVABLE AND REUSABLE - Privacy screen attaches via a silicone seal around the edge of the privacy screen. If silicone becomes dirty it can be washed with water and adhesion will return when dry. Screen includes plastic mounting plate and plastic carrying folder for screen storage when not in use. KEEP YOUR LAPTOP SCREEN PRIVATE - While people directly in front of the screen have a perfectly clear view; the view for those outside the 60° viewing angle is blocked to ensure privacy and security. 12% BRIGHTER THAN COMPETITIVE SOLUTIONS - Our privacy filters are brighter and clearer than other solutions and therefore ideally suited for today's high-resolution laptops and monitors. 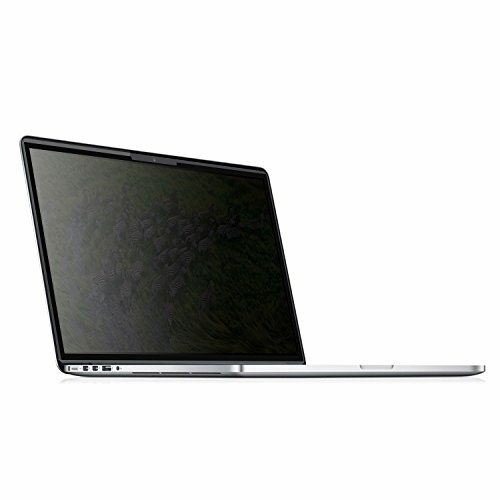 LIFETIME WARRANTY - Our Mac screen protectors and Macbook privacy filters benefit from a lifetime warranty. If they break, we will gladly repair, replace or refund you. If you have any questions about this product by GeckoCare, contact us by completing and submitting the form below. If you are looking for a specif part number, please include it with your message.